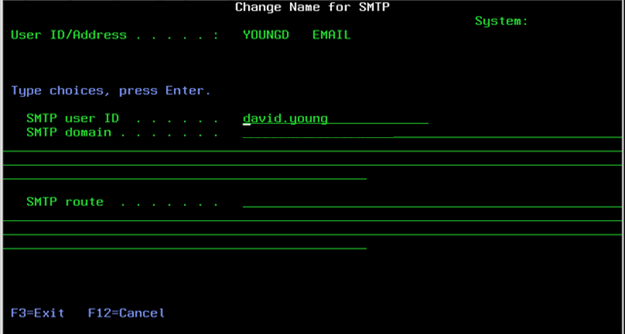 Activate the SMTP service on your IBM i systems to send emails. Your IBM i system can be used to send emails to your email server. Follow the procedure below to do this using the Send Distribution (SNDDST) command. The sender of the emails must be a local SNADS user. Choose option 20, Configure TCP/IP applications. Choose option 12, Configure SMTP. Choose option 3, Change SMTP attributes. 'mymailserver@company.com' is the DNS name of your mail server; check first locally which DNS name and TCP/IP address you'll have to use. The local mail server DNS name and IP Address must be added to the local AS/400 TCP/IP Host table using command CFGTCP and option 10, Work with TCP/IP host table entries. In our configuration we've added Internet address 111.11.111.111 with Host Name 'mymailserver@company.com'. Note: See the note at the end of these steps. It contains instructions that you can use instead of following steps 7 and 8.
firstname.lastname is the part from your email address before the "@" character. company.com is the part from your email address after the "@" character. * HOSTNAME to SYSTEMNAME (where SYSTEMNAME is the name of your system). * DMNNAME to company.com (where company.com is your company domain name). Instead of using escalation users and procedures, User Lists must be defined instead. See the section on User Lists in the latest QMessage Monitor IBM i User Guide (which is downloadable from the website). The QUEUE column will need to have a special entry of *MAIL. The user and system name will be used as the address to send the distribution. Once the User List has been defined it needs to be attached to the required Auto Reply records via the “Copy To” field.